For several years, I have been a member of Packer’s three running teams thoroughly enjoying each of the pros and running events each team has had to offered. Recently in the spring of the sophomore track season I tried the event long jump for the first hoping that I would be good at. However, to my dismay I wasn’t good at it—in fact I was quite horrible at it as I jumped 11ft for my very first jump. To compare my 11 ft jump, most decent freshman long jumpers jump at least 15 ft. If someone were to ask me why I was so bad at this event, I would’ve said that I didn’t have a jumpers body, I never tried it before in my life even in practice or that I didn’t have a coach to teach me. However, the truth was that I didn’t understand the physics behind long jump. As a first time long jumper, I always viewed long jump as the event where you run and just jump throwing yourself as far as possible into the sand pit. In very basic terms long jump is the act of trying to produce as much horizontal velocity as possible to convert that into vertical velocity through a powerful single leg “jump/push-off” in order to be launched through the air and gain a maximum total velocity. As you push-off from the air, the combined horizontal velocity you built up and then the sudden vertical jump will “arc” you into the sandpit. In case a visualization is needed of what a long jump looks like then this like would provide a good demonstration: click here. Essentially this act of horizontal and vertical velocity can be broken into three stages. The first stage is often called the approach and involves the runner trying to accelerate as fast as possible to close their top speed. The goal of this as you might have guessed is to produce as much horizontal velocity as the more horizontal velocity you produce the further you will carry yourself into the pit. This is because once the jumper is in the air there is very little that can be done to “help” the jump as there is no outside forces that can aid the jumper and the distance the jumper will jump is already by the amount of velocity he/she brought to the board. This is often why a lot of long jumpers are very good sprinters as a lot of speed means a good jump. The final part of the approach is called the take-off and it is where you impart your vertical velocity. Basically, this is where the jumper actually jumps at the white line (visualization). At take off, a jumper must jump as high as they can and it is important to note that the jumper is jumping straight up and not a bit out/forward. This is because both a high vertical velocity and a high horizontal velocity is necessary to get a huge final velocity. Without a high vertical jump at takeoff than the jumper would be subjected to more of their horizontal velocity which not only minimizes their potential but the arc of their jump would be closer to the sandpit potentially cutting the jump short. However as much as a high jump at take off is important, the speed at which you jump up is more important as ultimately the final velocity is affected by the speed in which you take off. 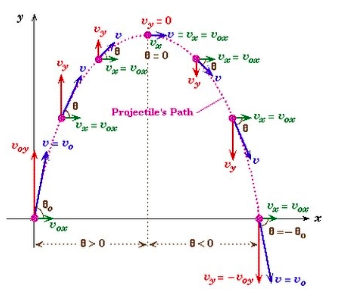 If the jumper were the projectile in the above diagram then one can see why vertical and horizontal velocity are so important since they determine about ¾ of the jump and is why take-off is so important. A jumper can take certain steps to make their take off more effective When a human runs, their stride is a predetermined length based off their body mechanics and their leg length/speed and the same is true for a long jumper except for the final two steps or the last stride. This is because the penultimate (or the second to last) step is longer than the every other step while the last step and the step/foot you jump off with is shorter than every other step. What this longer step allows is the the vertical displacement of the jumper’s hip which means the athlete can get a “pop” off the board (the white board) since the short step means that the athlete’s hip is on the rise faster. This pop can allow the jumper to ensure as much of their body’s displacement is going up when they jump up off their board ensuring a good vertical velocity. The final and third stage of long jumping is the flight and landing. This third stage is completely determined by the approach and take off. Once launched into the air, the jumper can do pretty much nothing to change his flight course/distance as there are no strong enough outside forces that can act on the system (being the jumper) to change anything which means inertia is in full effect if you ignore gravity. While in flight one such that can happen to a jumper is over rotation. An example of over rotation in long jump is this (click here). Over or even under rotation is bad for a jumper because if a jumper were to rotate any way during their jump then their jump would be dramatically reduced. This is the case because a jump is recorded based on the body part that is closest to the takeoff board so when a jumper rotates his/her legs or head would not be in the ideal position causes a short measurement. Rotation occurs in the first place because of inertia as an object in motion will remain in motion so a jumper must combat this expected rotation. To do this jumpers can use their arms by swinging them down and back and then up again which allows the torso to combat that horizontal velocity which is telling their body to go forward. To end the jump, a jumper simply has to make sure that they touch the sand pit with two feet and try to squat/bring their torso as close to their heels as much as possible to get as a big of a jump as possible. ​Once a jumper understands the important of vertical and horizontal velocity they calculate exactly what they would need to do to jump a certain distance or how fast they went if they know their distance.